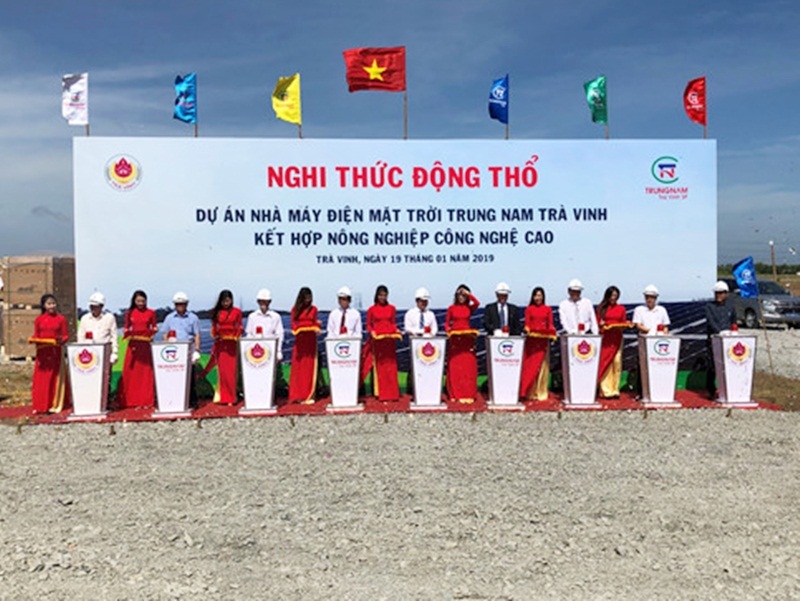 On January 19, 2019, Trung Nam Tra Vinh Solar Power, a member of Trung Nam group held a ceremony for groundbreaking Trung Nam Tra Vinh solar power combining high-tech agricultural project in Dan Thanh commune, Duyen Hai town, Tra Vinh province. Trung Nam Tra Vinh solar power project with a capacity of 165 MWp and a total investment of more than 3,500 billion VND is expected to be completed and put into operation in the second quarter of 2019. The project including 32 inverter components, one 220/22 kV transformer substation with a capacity of 2x90 MVA and more than 440 thousand PV solar panels on more than 7 thousand supports, will be developed on an area of 171 ha. Due to that the project locates not far from the 500/220 kV transformer substation of Duyen Hai power center, when being completed, all its capacity could be rightly put into the national power system. Tra Vinh province has a hot and humid monsoon climate with the two distinct seasons. The average annual radiation measured in Tra Vinh coastal area is 1,700 kWh - 1,900 kWh/m2 (the average daily radiation of 4.9 kWh/m2). This creates the good conditions for the province to develop solar power projects for responding the energy planning in the southwestern provinces.